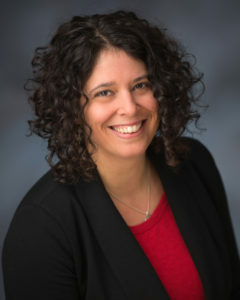 Portland State University Library is pleased to announce the winner of the 2016 Kenneth W. and Elsie W. Butler Award for Library Faculty Service, Assistant Professor and Urban and Public Affairs Librarian Emily Ford. A dedicated librarian, Professor Ford’s knowledge, creativity, and commitment to serving library patrons have made important and lasting contributions at Portland State University. The Kenneth W. and Elsie W. Butler Award for Library Faculty Service is given annually to recognize excellence of library service to students, faculty and other patrons of the Portland State Library. The award was established through an endowment by Professor Emeritus Kenneth W. Butler and his wife Elsie W. Butler, and it continues to be supported by their daughters. Learn more about the Butler Award and previous recipients.